FULL TIME, LUXURY LIVING IS WHAT YOU'LL FIND HERE! FRONT LIVING ROOM FEATURING 1-1/2 BATHS! YOU'VE GOT TOO SEE THIS 5TH WHEEL! 1/2 TON TOWABLE, TRIPLE SLIDE-OUT 5TH WHEEL. OUR SALE PRICE INCLUDES FREIGHT & DEALER PREP! ROOM FOR THE WHOLE FAMILY! 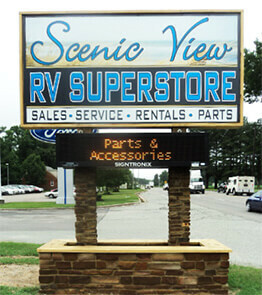 Welcome to Scenic View RV in West Point, Virginia! Scenic View RV is family-owned and operated by Nick and Susan Bollhorst who are avid RVers. We're pleased to carry Coachmen and Starcraft brand RVs, among many others that we are certain that you will love. These top RV brands have superior quality of construction, greater durability, more amenities and higher value than many other RVs available today. You'll find a wide range of floor plans and sizes to meet your needs, budget and towing requirements. Our factory trained RV staff has years of experience to help with your RV needs, whatever they may be.